Ghee, the very essence of butter is known as ‘nectar of the Gods’ and ‘liquid gold’ because of its nutritional benefits, medicinal qualities and taste. It’s taste is sweet and creamy and very different from butter. 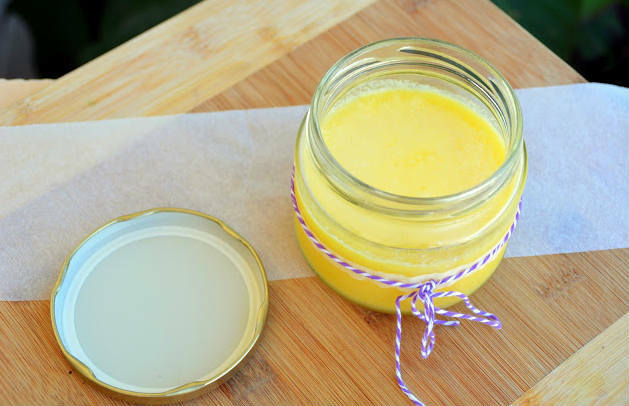 During the process of making ghee the milk solids are removed reducing the levels of milk proteins and lactose leaving only trace amounts behind making it favourable for those who have sensitivities to dairy. The smoke point of ghee is one of the highest of oils at 250°C (482°F) ensuring that no toxic free radicals will be released when cooking with ghee. Free radicals can injure cells and DNA in our bodies by forming dangerous compounds when it reacts with oxygen after the oil is heated beyond its smoking point. The nutritional benefits of ghee are many. It contains short, medium and long-chain fatty acids. It is rich in CLA (Conjugated Linoleic Acid), a potent anti-oxidant. Butyric acid, a short-chain fatty acid found in ghee strengthens the digestive and immune system and acts as an anti-inflammatory. It is rich with vitamins A, D, E and K, 9 essential fatty acids and Omega 3 Fatty Acids. Due to ghee’s beneficial fatty acid composition it has the ability to reduce cholesterol levels and improve heart health. Having never been a fan of butter, after discovering ghee I use it for frying and in place of butter in sauces such as béchamel sauce, the result of which lends it is a nutty, carmelised flavour. It is favoured in Ayurveda as it is tridoshic, balancing all three constitutions, Vata, Pitta, and Kapha. According to Dr. Vasant Lad, founder of the Ayurvedic Institute, it helps to lubricate the connective tissue and promote flexibility, making it the oil of choice for those who practice yoga. Place the butter in a heavy-bottomed saucepan over a low to medium heat and allow the butter to melt fully. Once melted reduce to a low heat for 15-30 minutes (this will vary depending on how hot your stove is). The butter should be at a simmer and small bubbles forming at the surface. During the process of making ghee the milk solids will sink to the bottom and a layer of foam will rise to the top leaving a layer of oil, the ghee, in the middle. Do not remove the foam nor the milk solids at this point. The milk solids and gives the carmelised flavour and in Ayurveda the foam is said to have medicinal qualities and should not be removed until the very end as the medicinal qualities will absorb into the ghee during the cooking process. When the bubbling has stopped and the oil is a golden yellow color then the Golden Nectar is ready. If left on the heat for too long the ghee will burn and take on a dark color. Turn off the heat. Pour the golden nectar through a finely meshed sieve twice, once in to a glass pouring jug and secondly into an airtight glass jar for storage. Allow to cool. The Golden Nectar can be stored in the fridge or a cupboard, where it will remain as an oil.